No one is more surprised than I am that I like this film so much. I am on record repeatedly as loathing Sonam Kapoor as an actor and Manic Pixie Dream Girls in general; I'm no fan of the House of Mouse; I merely like (not love) the original but would never have chosen Sonam to do a Rekha role; I don't find Mr. Darcy/Grumpy Pants type characters automatically attractive; and I don't even have Fawad Fever. But here we are. Maybe I'm just in the mood for some dil-squish, but Khoobsurat's romance is delightful and resonant and believable despite trading in major tropes. As friend Vishal says, it earns all its filmy moments. It helps very much that the characters are actual adults: they're responding to innate desire and affection rather than unsettling passion or any non-self-determined need for a romantic partner, which cuts down the drama considerably. They are sad without each other, but nobody does anything self-destructive when they separate. How unbelievably refreshing to have a buttoned-up, "respectable" man and a woman (any woman) express sexual desire without censure from outside! I love that the film is willing to show the drawbacks and benefits of both of their personalities and temperaments and is harsh to neither. We viewers know Vikram and all the Rahtores need to lighten up and let go (and will do so), but we also see all sorts of signs of their success and, for the most part, functionality. This is not the typical movie Rajput family of generations of enmity and violence (and the writers hilariously give the requisite line about "I'm a Rajput! I'm fierce!" to the quiet teenage girl). Their house is not dusty with the weight of history or dissipation, and their staff works efficiently and is part of the modern world. They're not bad people—they're just hurting. Mili, for her part, definitely doesn't fit in, but she also doesn't give in. She appears to be a MPDG, but she's an actual woman (not girl) and it is her profession to help people, not her special mission just for one sad sack of a man; she will survive the film, not make his cure her swan song. The person she falls for is one level removed from the person she's most directly trying to serve—the romance is collateral benefit to her actual purpose. 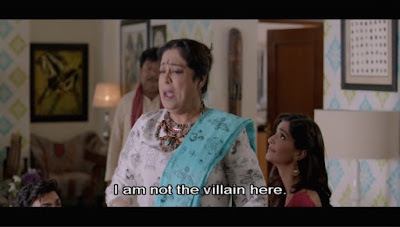 Mili also brings to bear the other great Bollywood regional stereotype without any literal balle balle, and her mother is blunt and loud without reverting to utter Punjabi Maa hysterics (given what we've seen Kiron Kher do elsewhere in roles of similar demographics, that's impressive). Mili and Vikram are certain enough of themselves that they are well poised to collaborate as a couple. Yes, they're different, but they know it, and they also know how to navigate conflicts, at least in their professional lives, and they have learned how to compromise. 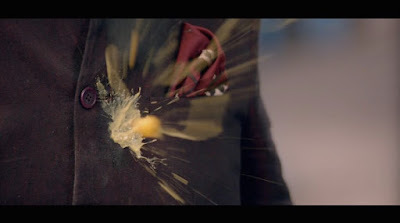 The best part of the Bridget Jones's Diary movie for me has always been Mark Darcy telling Bridget he loves her just as she is, and Khoobsurat offers the same joy. What a freedom that is, to be accepted for who you are, including your innate potential to improve and adjust within yourself. Love is not being identical to another person; love is understanding them. "Love is not just looking at each other, it's looking in the same direction" (Antoine de Saint-Exupéry), and these two have the same desires, not just for each other but for the other people in their worlds. We also know that they listen to each other; he takes her advice after weighing it and finding it beneficial, and she is attuned to what other people feel and tries to act on it. Mili actually says she'd prefer to be alone than deal with men who want her to be someone she isn't, and by the time we meet her in the story she seems to have stopped taking "we have nothing in common" as criticism. She is comfortable enough in her own skin to to just be her own, different self even when her oddness is remarked upon by a colleague and a high-powered client. That is an amazing feat for any human, especially a female character in popular media. A heroine who gives zero f*cks but is also a kind person, someone who wants to participate in things but doesn't let them drag her down. Perhaps that's because, as another twitter friend pointed out, Mili's family loves and respects her. Like in Queen, we see what women can do and how happy they can be when they have a genuinely supportive system behind them. I think it could be argued that Vikram does (and, it is implied, will do) more changing, but I think we also don't know what Vikram was like before [spoiler backstory], so we don't know what his deep-down self is or prefers to be. Besides, Mili's influence and actualskillsextend just as much to Vikram's family as to him as an individual. In both her professional and personal capacities, she helps the system of which he is (and wants to remain) a part and which he values. There is so much Khoobsurat does in telling this admittedly predictable story that is special. First, SNEHA KHANWALKAR ZINDABAD! Her music is largely unexpected in this context, mirroring Mili herself, and I love it. Second, the film is just so beautiful to look at. The palatial architecture and interiors are just as gorgeous as they always are in films in Rajasthan, but somehow they seem a little more human-scale here, perhaps because we see them through Mili's undaunted eyes and she quickly makes them her own. Third, everyone's acting really is wonderful. I haven't seen any of Fawad Khan's tv work but here he is the type of actor who can probably have chemistry with a lamp post; by some miracle, Sonam Kapoor is expressive and exuberant without being ridiculous, even when her character feints that direction. They're a great pair. When he relaxes and she calms down, there is a space between them that feels so loving. Fourth, the clothes. He is all smooth surfaces and class; she is all color and chaos. I'm sure it's unrealistic that a doctor would dress as she does, especially when working in the already not-as-professional setting of someone's home, but it seems consistent with her character. 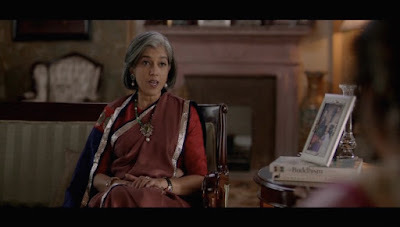 (We know she can wear something more work-like; in the opening segment in the cricket match she's wearing a team shirt.) Fifth, the other characters are used very well, just enough to add useful context and texture without distracting. There really isn't a B plot in this film, and vah vah to a creative team for knowing it doesn't need one. Sixth, the inner monologue voiceovers by the lead characters are so funny and honest, and the contrast they create with what the characters actually say out loud to other people feels very, very real. They underscore how hard it can be to say what you really think, whether you appear to be all Mili-impulse or all Vikram-control. delights me. Shashanka Ghosh brings a performance out of Sonam Kapoor that is by leaps and bounds a career best. I almost want to call this film candy floss for how sweet it is, but don't sell Khoobsuratshort: it actually has a lot of important things to say about self-knowledge, self-confidence, healing pain, and reserving judgment, and it says them with remarkable gentleness and fun. I loved the film. I have already seen it twice. I have grown to like Sonam over the years, and I liked her much better in this film, than I did Rekha in the original 'Khoobsurat'. I don't like Manic Pixie Girls in general but Sonam seems to be able to handle them much more than other actresses. Also, I like her brashness at interviews, it's a lot of fun in these days of very boring, politically correct interviews for the most part. I'm in good company here! I thoroughly enjoyed the movie. I liked the movie quiet a lot and am starting to suffer from Fawad fever especially after watching Kapoor & Sons but that is besde point! 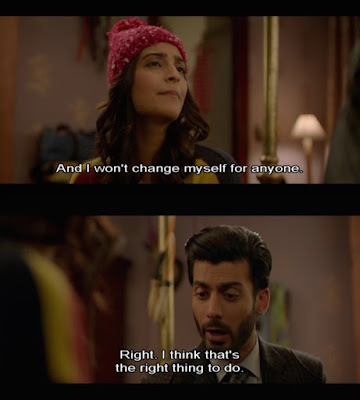 I would like to know if someone noticed that Khoobsurat is indian version of Pretty Woman(you remember Julia roberts and Richard Gere a lifetime ago it seems!). A story of a ruthless cold and rich businessman who meets a bubbly happy and poor girl. Under her influence he changes and his business method change too. And even though they are inlove he lets her go thinking that they are far too different to fit into each other's world(actually she has to fit into his world). And of course some soul searching and some well wishers make him realise that she's the one and he goes after her in a grand romantic gesture! Please somebody convince me Khoobsurat 2014 is not Pretty women hindi cinema style! Amile - Khubsoorat is not like Pretty Woman at all! I see no similarities of any significance.